Despite the challenges faced by many markets over the past year, a number of fund managers have been able to maintain a level of performance significantly greater than their peers. To help identify the funds that have excelled within their sectors this year we analysed the performance of more than 20,000 funds and their various share classes spread across 35 investment sectors identifying those that have ranked 1st in their sector over the recent year. 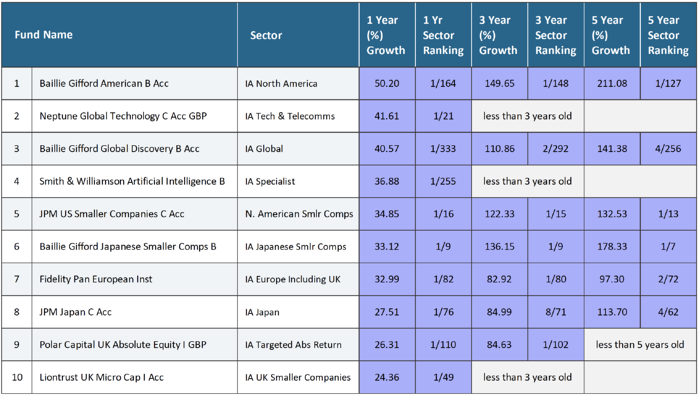 The Baillie Gifford American Fund aims to deliver significant outperformance for investors by identifying exceptional growth companies in America and owning them for long enough that the advantages of their respective business models and the strength of their individual cultures become the dominant drivers of their stock prices. Baillie Gifford has employed this strategy since the launch of their fund in 1997. This fund has consistently delivered exceptional performance. In the 12 months up to 1st October 2018, this fund returned growth of 50.20%, which was highest of all 164 funds in the North American sector. The Baillie Gifford Global Discovery fund has an exceptional performance history since it’s launch in 2011. Managed primarily by Douglas Brodie, this Global equity fund has a spread of assets across North America, UK, Europe, Asia and Emerging Markets. The top holdings of this fund include biopharmaceutical company Ainylam, which Forbes includes in its 100 most innovate growth companies list and the Ocado Group, which is a British online supermarket and a member of the FTSE 100 Index. This Global fund currently holds some £631million of client assets and its 1-year growth of 40.57% was the highest of all 333 funds in the competitive Global sector. This fund has also consistently been among the top 2% of funds in its sector for growth over the recent 5-year period. Smith & Williamson launched this Fund at a crucial moment for AI, which many experts believe is set to expand exponentially and drive economic growth around the world. They believe that to get the most from the investment opportunities presented by AI’s influence on the global economy requires the flexibility afforded by an active management approach. Since its launch in June 2017, this specialist fund has attracted £140 Million of client assets. Although this fund has had a difficult few months, it remains the highest growth fund in the Specialist sector over the recent 12-months with growth of 36.88%. The JPM US Smaller Companies fund is an actively managed fund that sits within the North American Smaller Companies sector alongside 15 competing funds. Launched in 1987 this fund currently has funds under management exceeding £230 Million, which is notably less than many of its peers. Despite its comparatively small size, over the recent 1, 3 & 5-year period this fund has returned cumulative growth of 34.85%, 122.33%, and 132.53% - which was higher than any other fund in its sector. As its name suggests, this funds mandate is to invest in Japanese Smaller Companies. Their top holdings include e-commerce retailer Monotaro, who Forbes Asia named in their ‘Best under a Billion’ list. Launched in 1983 this fund has consistently returned the highest growth in its sector. Over the recent 1, 3 & 5 year periods it returned cumulative growth of 33.12%, 136.15%, and 178.33% making it one of the most attractive funds in the Japanese market. The Fidelity Pan European fund has holdings in big international, dollar-earning companies such as Royal Dutch Shell, BP and British American Tobacco which has helped drive its performance in recent months. This fund's recent 1-year growth of 32.99%, was the 7th highest in the entire IA universe. However, its sharp performance spikes have made this fund highly volatile, and its size of just £3million makes it one of the smallest funds in its sector. This aggressive Japanese equity aims to capitalise on a resurgent Japan by harnessing local knowledge and insights to take full advantage of Japans long-term structural trends. Managed by an investment team based in Tokyo, this fund invests heavily in Keyence, which is seen as Japan's New Wave of Tech Giants. Despite suffering a difficult few months, this fund has managed to return cumulative growth of 27.51%, 84.99%, and 113.70% over the recent 1, 3 & 5-years, which makes it consistently one of the best performing funds in the Japanese sector. This fund aims to achieve a positive absolute return on a 12-month rolling basis by investing predominantly in UK companies and, to a lesser degree, in European and Global Equities. Launched in 2014 this fund is currently managed by former L&G fund manager Guy Rushton and to date, it holds some £665million of client funds under management. Over the recent 12 months, this fund returned growth of 26.31%, which was better than all 109 other funds in its sector and over 3-years its growth of 84.63% was also the highest in its entire sector. However, this fund is currently ‘soft-closed’ and is not currently available to new investors. The Fund has been managed since launch in March 2016 by Anthony Cross, Julian Fosh, Victoria Stevens and Matt Tonge and seeks to invest in profitable UK headquartered companies with high managerial ownership and a market capitalisation of under £150 million. The fund managers use the Economic Advantage investment process to try to identify companies with a durable competitive advantage, allowing them to defy industry competition and sustain a higher than average level of profitability for longer than expected. Despite only launching in March 2016, this fund has managed to return the highest growth in the UK Smaller Companies sector over the recent 12-months. Efficient investing requires continuous monitoring of both asset allocation and portfolio composition. Making sure your portfolio contains quality funds within a suitably balanced asset allocation model will help you get the most efficient returns from your investments. The best funds featured in this report provides clarity as to which funds have been the best performers within their sectors over the recent 12-months. However, it is important to look beyond short-term performance when making investment decisions as funds, such as those in this report, may not necessarily be the most suitable long-term investment option for your specific portfolio.